If you have finished installation of HMWP plugin you should go to the settings page (Dashboard >> Settings >> Hide My WP), enter your HMWP purchase code and then configure the plugin. To get you started quickly we have provided number of pre-made settings for you. You can apply one of these pre-made settings from Start tab >> Import Options. 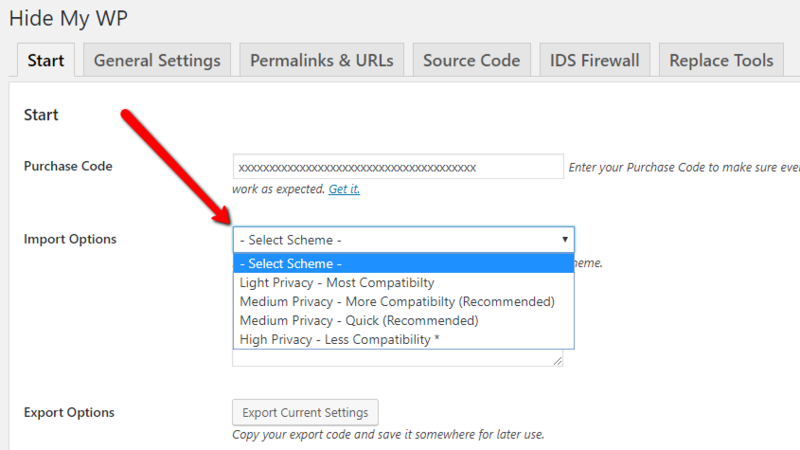 For example you can choose ‘Medium Privacy – More Compatibility’ scheme and click ‘Save Settings’ button.